A guide to the mice life cycle – What do mice eat? Mice are a very common creature that we see in our daily lives. They are mainly seen as common household pests as they have the tendency to enter our houses and create a lot of problems in our lives. Not all see these mice in the same light. Some people find them very cute and adorable. Many keep mice as pets. Another fact that can be very revolting for some is that in many parts of the world, the meat of mice is considered to be a delicacy. Here we are going to discuss the mice life cycle that will give us a detailed view about these rodents. The gestation period of the different types of the mice usually last for about 20 days. This starts immediately after the successful breeding of the parent mice couple. This period is not very prolonged and this gives way to the other stages of the mice life cycle. Thus, the gestation period of mice is the starting point of their lives. After the brief gestation period, comes the time for the mother to give birth to the litter. The baby mice are called pups. The average number of babies that the mother gives birth to ranges from 10-12. This is the starting of the actual lifespan of mice as we begin to start the process of numbering the days of its life from this day onwards. This stage is very brief for the mice. The stage of infancy has duration of only one week. During this time in the life of the mice, the pups are very helpless as they can do nothing by themselves. They depend on the mother who feeds them, nurtures them, cares for them and protects them. The pups of brown mice also pass through the same stage. The pups do not have open eyes. The eyes open only at the end of their infancy. The body of the pups is devoid of any fur. The body of the mice pups shows the first signs of entering the second stage, which is the adolescence, with the start of the appearance of fur on their body during the ending of the first stage of their lives. The brown mice show the emergence of tiny, very light brown furs on their bodies. Adolescence lasts for a few weeks and this give a new shape to the personality of the mice. Their eyes open during the second week of their lives. The new sight makes the mice very active. They start learning to fend for themselves. The appetite of the mice grows to support the energy needs of the growing body. During the gestation period of mice, the mother provides all the energy to the fetus. 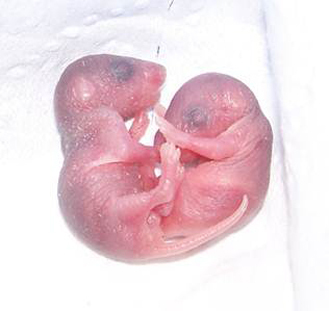 The mice get to their optimal sexual activeness when they are around 5-10 weeks old. The mice gain their adulthood after reaching optimal sexual maturity. This is the most important stage where mice becomes independent and fends for itself. This is the stage where the mice look out for a mate to reproduce and give birth to their own pups. This is the most important and the last stage in the life to the mice. The most important thing that has to be kept in mind is the average life span of the common mice. There are many factors that influence this. Average common house mice have a life span of around 2 to 3 years. Within this time span, the mice complete the different stages of their lives. Thought, it has been seen that if proper conditions favoring the life of a mouse are provided, they can live for about 6 years. This can only be possible if proper food and medical care is provided to the mice. Thus, this article brings to the limelight the various stages which are related to the life of a mouse and the average life span of it.